Recently I posted about some big changes I have made to my nutrition that go a little against the grain as far as eating for optimal performance (find the previous post here). Essentially I dropped my intake down to 13 Zone balanced blocks a day with 1x fat (this includes my post WOD shake that I count as 3 of my blocks). This equates to roughly 1300 calories a day. If you are familiar with the Zone you know that this means I keep my protein and fat levels very moderate, stick to fruits and vegetables as carb sources, and balance everything in specific portions every time I eat. What I have found is that I am thriving with this major caloric restriction. My performance has shot through the roof. I received a lot of great feedback and questions regarding my experience and thoughts on how this works and if it could benefit others. Thanks everyone for the questions! Q: I don’t understand how you are training that hard in a caloric deficit and still gaining strength at the same time. Im cutting down some extra weight as well for the open, however my coach keeps on telling me that I need to eat more when doing harder training. I am 18 years old with a body weight of 160lbs. I train 1-3 times a day. How much food would you recommend for me to take? A: Thanks for reaching out and great question. Without knowing your complete story I would recommend listening to your coach. At 160# and 18 years old you definitely have room to build some muscle. Most of the top CF athletes are 185# and up. If you want to email me I can help you if you give me more background on yourself. The way I do things is VERY different from the way pretty much everyone else does this. This includes the volume per day. Shoot me an email at Jeremy@CrossFitKinnick.com. Q: I started paleo back in April of 2013 I went from 197 with 16% body fat down to 175 and 9% in 45 days. Right now I am at 178 and 9 to 10% this was all paleo using the zone….my sprinting and gymnastics has improved tremendously but my lifts have gone down slightly…any advice? A: Congrats on your success thus far! So have you been using a Paleo/Zone? In my opinion thats very close to the best way to eat. Either way those are some solid results. Make sure your focus is not on the weight but on your performance. Its hard to give advice without knowing a lot more info from you. Like how much you are eating, your programming, your days on and off, etc. If you are interested in some consulting I can help you out and give you my opinion on what you should be doing. Email me if you want some help Jeremy@CrossFitKinnick.com. 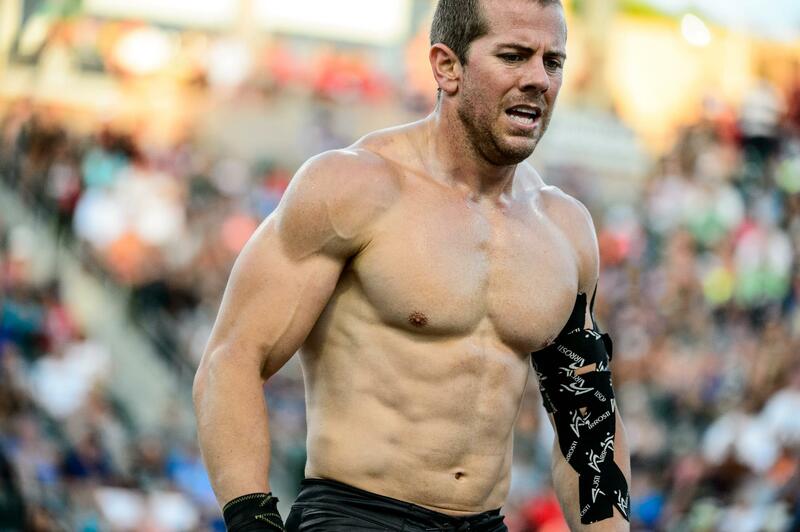 3) Jeremy, awesome post – it’s really cool to see someone as elite as a Games competitor doing something that some would consider crazy like losing lean body mass on purpose. I think you’re dead on in the benefits that it’s going to give you, particularly in power to weight ratio and Oxygen Efficiency. I am actually trying to do the same thing, you think you could weigh in on a strategy? I’m fairly new to Crossfit and I have a bodybuilding/football backgound. I’m a lean 190 @ 5’10″, so need to drop some mass that’s just creating more of a demand for oxygen in metcons and keeping me from reaching the next level in bodyweight movements. Would your plan work for me? Is the general strategy just to work out a lot and underfeed until you hit goal weight? Any color commentary would be much appreciated! A: Thank you and I appreciate the feedback! I saw incredible success doing the same thing in 2011 leading up to the Open, Regionals, and the Games. This year I am seeing even better results due to smarter programming and a better understanding of eating. From what it sounds like you don’t need to do what I am doing. You are new to Crossfit and weigh 190# at 5’10. Thats about where I am. Getting lighter for you isnt something I would necessarily recommend. Its hard to tell without knowing more about what you are doing. Sounds to me like you just need to do more Crossfit bud and focus on those weaknesses. If you want me to create a plan for you I can definitely help with that. Without details it is hard to give quality advice. This strategy is something that I am doing based on my experience competing in Crossfit for the past 7 years and seeing my results at a heavier bodyweight. Hope that makes sense and helps If you want some help email me at Jeremy@CrossFitKinnick.com. Thanks again for the feedback! 4) What does a typical meal day for you look like? A: Great question! It all depends on my workout schedule vs my training classes schedule. For the most part I wake up (around 7am) and within an hour have a 1 block breakfast of 1 fried egg, 1/4 block of steamed kale, 3/4 block of sweet potato, and a couple blocks of fat to cook my eggs. Then the fun begins and I start working out. I typically don’t eat again until 1pm or so. Then I will have the biggest 2 block salad you could ever imagine. It consists of 2 blocks of organic ground beef, 1 block of kale, 1/4 block onions, 1/4 block sugar snap peas, some artichoke hearts, a couple cups of mushrooms, and whatever other veggies I have in the fridge. I either use apple cider vinegar or coconut vinegar for my dressing and 2 blocks of olive oil or coconut oil or grass fed butter for my fat. I typically have a couple 1 block meals mixed in the rest of the day along with another salad like that, and 2 or 3 blocks at night before bed. My meals are very similar. I get a lot of greens in and only eat coconut oil, grass fed butter, and a little olive oil for my fat. My protein is typically organic grass fed ground beef or eggs. Hope that helps. Q: Awesome write up. In the time I’ve done crossfit I feel like nutrition has been the biggest learning curve. There is always more info to learn and understand. I’m a little amazed by the 13 blocks a day but you do mention that its while you are working on hitting your competition weight goal. I’m curious how much of a transition in terms of quantity that has been than Prior to this goal. How many blocks were you eating before? A: Thanks for reaching out. In the 7 years of Crossfit I have seen the most dramatic improvements in myself and my athletes when they are eating a perfect Zone with no cheat meals and no deviation. Is it easy? No, but that’s ok. At some point I will start to slowly increase my fat intake. Then I will slowly increase my number of blocks, but only to maintain my bodyweight. I don’t expect to eat much more than 13 blocks a day. My body is thriving off of this and so are my athletes at the box. Again this isn’t for everyone. Before this I was eating about 16 -18 blocks and not really controlling my fat intake. Hope that makes sense and thanks again for the post. Jeremy, first off, thanks for the input you are giving everyone and taking the time out to do this. Very awesome. In a related post, you mentioned that your 13-block days include your protein shake. What’s in the shake and is this pre or post wod(s)? Thanks again.